We are not sure whether we should call it a story of hard work or kindness. We spend most of our time in our comfortable cars and homes. Those are the times, when we do not think of all those people, who are suffering and trying to earn a penny to buy a piece of bread for a family of four. There is one man, who actually thought about all this. He did not have a fancy home or a fortune in his bank account. 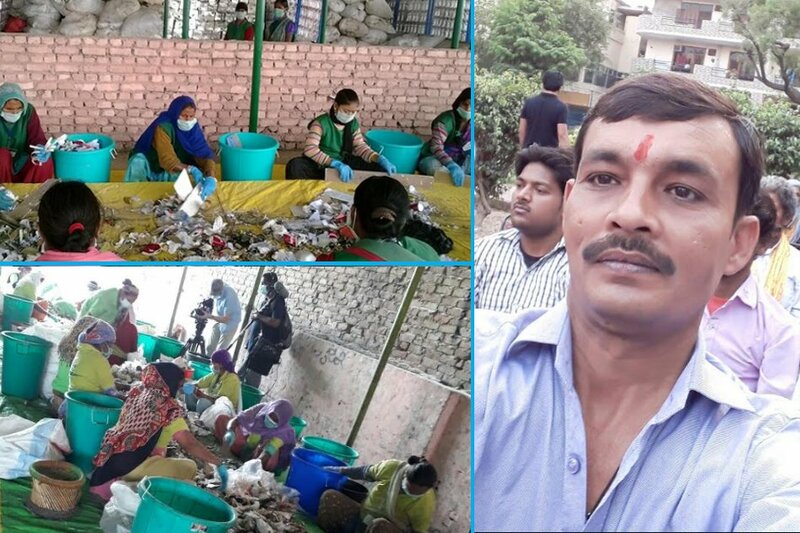 He was a simple ragpicker, who now feeds 160 families. 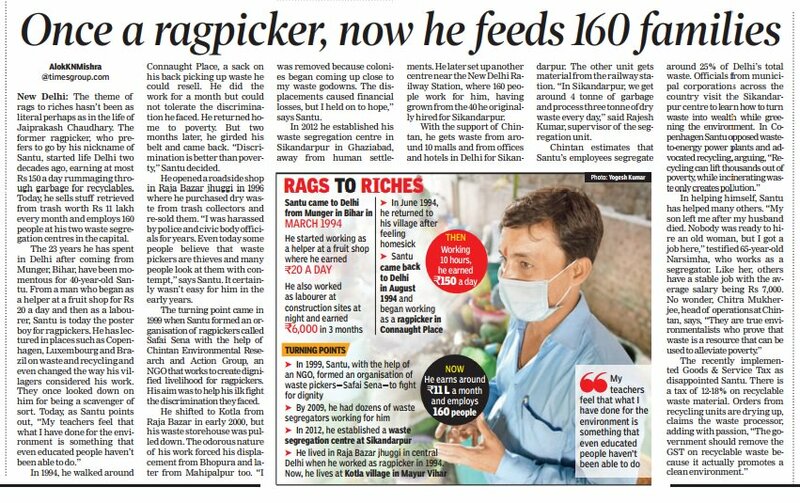 This story is about Jaiprakash Chaudhary, who was once a ragpicker. Today, he is inspiring the whole world to step out of their comfort zone and do something about ending starvation. He prefers being called Santu and he has been living in Delhi for the past 23 years. 40 year old Santu hailed from Bihar 23 years back. He started as a helper at a fruits shop and earned a mere 20 rupees per day. He feels that discrimination is far better than poverty. People looked down at him as a scavenger but he did not lose hope and continued to sell the waste. He had only one vision which was to do something for the environment. In the year 1996, he started a small shop in Raja Bazar jhuggi. He sold the dry waste which could be re-used. He was harassed by the cops but he never left his mission behind. His fine days started in the year 1999 when he formed an association for the ragpickers. The organization is called Safai Sena. All this was possible once Santu joined hands with the NGO called Chintan. He had to shift from place to place but the displacement did not diminish his hopes and vision. 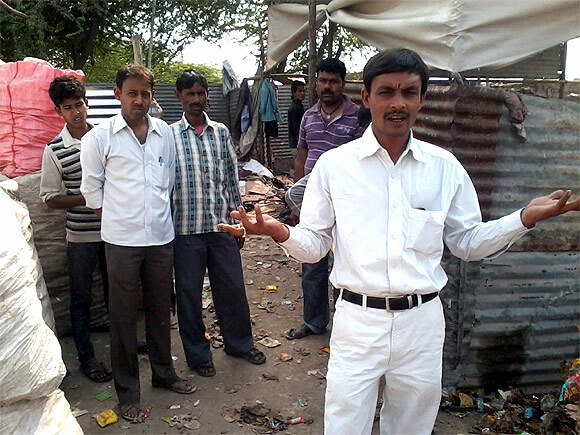 In the year 2012, Santu started his own waste segregation in Ghaziabad. He set up another centre near the famous New Delhi Railway station. 160 people work under him today and he has finally achieved what he really wanted and believed in. It is all about believing in yourself and your vision. Santu has proved it! He is an inspiration for the country. How many people think about the country’s well-being? If you ask me, I would say that this is the true form of Swachh Bharat. The humble man has hired many homeless and poor people, who are getting food in their home because of Santu. He is known as the job creator in Delhi and he gets blessings from several women. The sad news is that after the GST arrived, he has to pay 12-18% tax for the recyclable waste. This seems unfair because there is no GST on alcohol. Shouldn’t the government remove such a tax? This is a noble cause and it is a step towards reducing pollution and making our city clean. We need more people like Santu and we definitely need to remove the unnecessary GST on recyclable waste. Hats off to Santu!